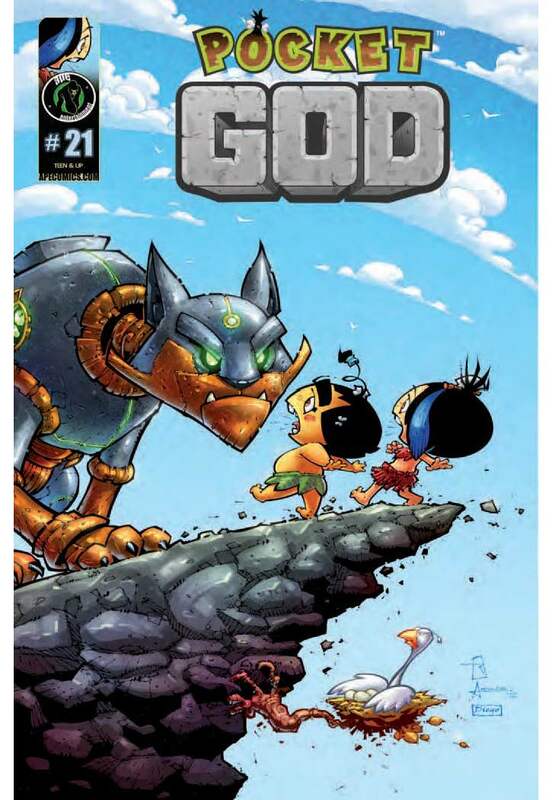 The Fellowship was fortunate enough to obtain a copy of POCKET GOD #21 from APE Entertainment. Jason M. Burns writes and Rolando Mallada draws. The pygmies are back to normal. Meaning that their gems are making them immortal again. And now they’re trying to decide what to do now that they danger is past. But it’s never that easy; they soon discover that something is out to capture them. They also discover that the girls’ island isn’t really an island. So will they stay and fight, or run and hide? These little folks may be cute, but don’t let that fool you. There are some real characters in here, and some really nice interactions between them. They have little conflicts, but they seem to work together when they need to. And that’s good, because it looks like they’re going to need some cooperation now. So if you’re interested in a comic with large-headed characters who don’t mind getting killed (because they pop back to life somewhere safe), check this one out. It’s quite entertaining. 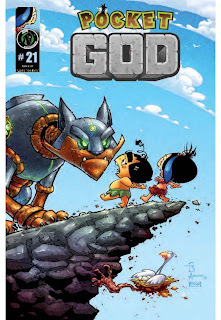 POCKET GOD #21 is available now at your FLCS or by order at ape-entertainment.com.